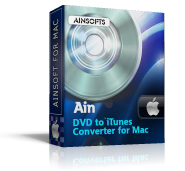 Ainsoft DVD to iTunes Converter for Mac is specially designed for Mac users. It is perfectly compatible with Mac OS. You can convert DVD movies to iTunes video on Mac OS X. It will help you convert DVD to video formats like iTunes MP4, M4V, MOV and audio formats like MP3, M4A, WAV, AIFF which supported by iTunes (including iTunes 9). Moreover, Ainsoft DVD to iTunes Converter for Mac enables you to preview movies before converting, customize output file effect, convert any segment of the DVD movie and so on. You can clip the DVD movie to get the part you like by setting the start time and end time. 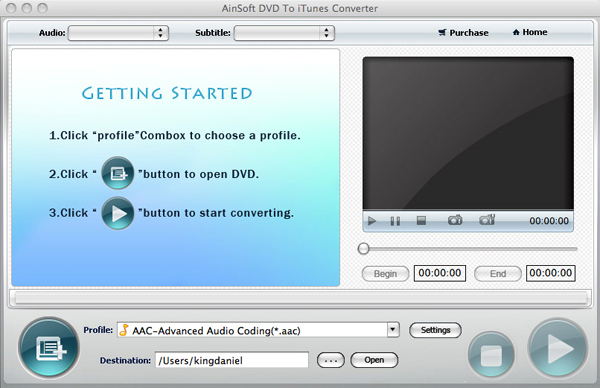 With Ainsoft DVD to iTunes Converter for Mac, you can convert the main part of the movie once and for all; you can also select several of the chapters to proceed a multi-conversion at the same time. Except customizing the video size, video and audio quality, audio channel, you can add or change other effects (reset the video brightness, contrast, saturation, etc.) to the video you want to convert. Preview window offer you a chance to enjoy your DVD movies in advance, moreover, benefit from this preview function, you can use it as a palyer.